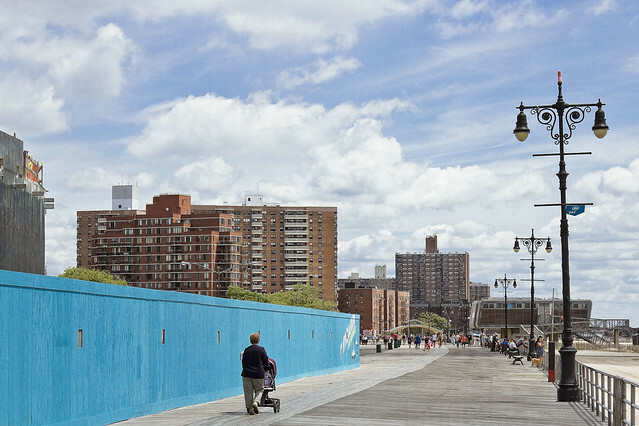 Continuing from a visit to Coney Island, in today’s post. 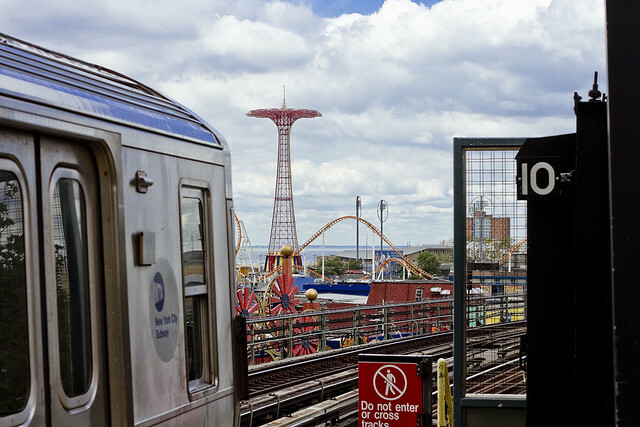 Described laboriously in prior posts, one took the Brighton (or Q) Line Subway from Astoria, Queens to the former site of the Dreamland Amusement Park in Brooklyn’s Coney Island, which has housed the NY Aquarium since 1957, and then decided to turn east in a moment of whimsy. 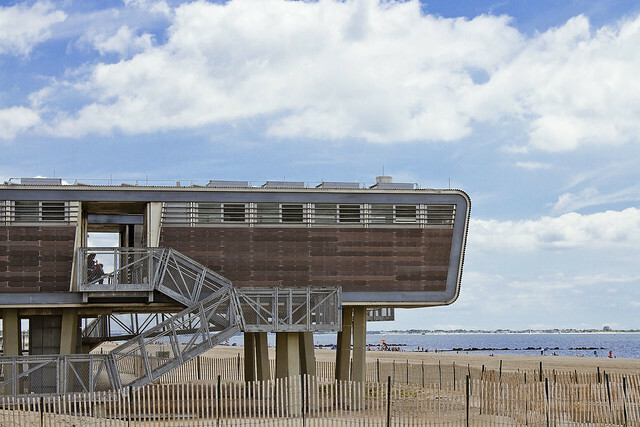 I was headed for Ocean Parkway and Brighton Beach Avenue when I encountered something kind of odd in the grassy border of the Coney Island Boardwalk along Surf Avenue just before it loops into Ocean Parkway. 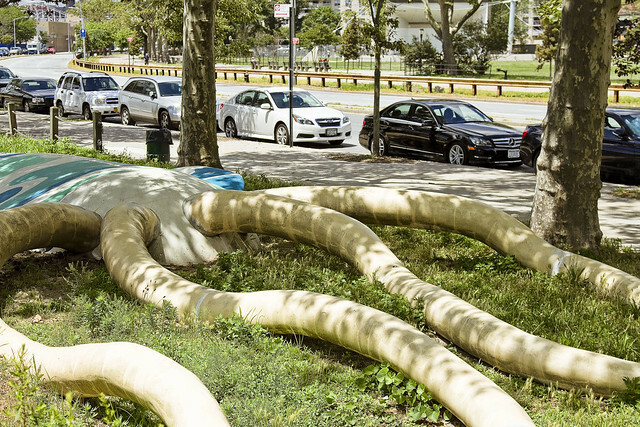 An enormous concrete sculpture of a giant squid, with its tentacles playing out over a fish. In the shot above, Im standing on the squid. 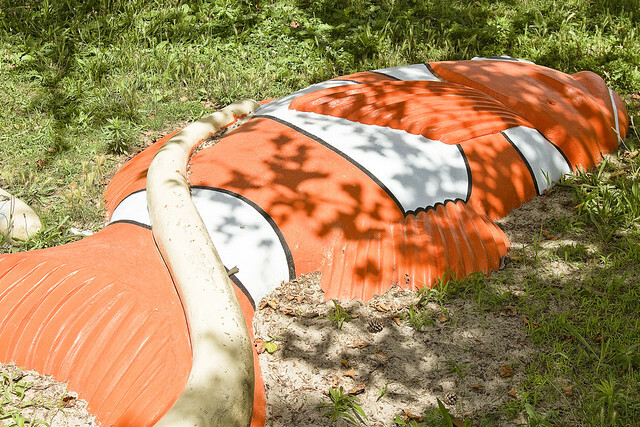 Oddly enough since its in a NYC Parks Dept. property, and I looked around quite a bit for information on this item, I couldn’t find any sort of documentation on it. 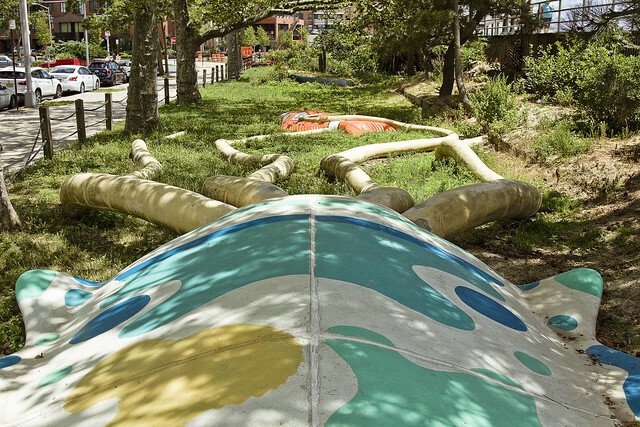 It had all the appearances of emanating from the Parks playground design people employed by Robert Moses back in the 1950’s and 60’s – concrete construction and all, but there’s “bupkis” online information about it. That’s weird. 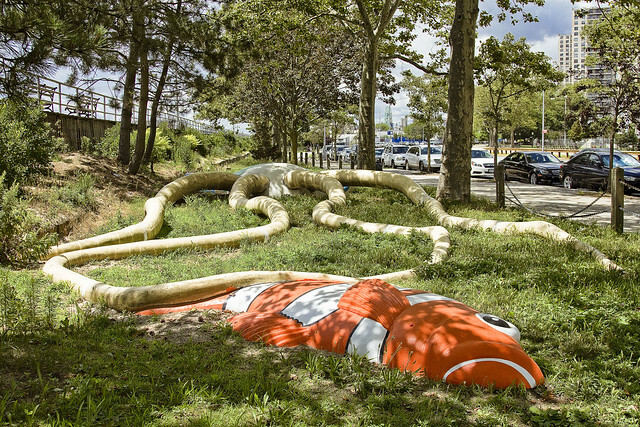 Some enterprising Brooklynite has painted the fish caught in the squid’s tentacles to resemble the Nemo character from the Disney “Finding Nemo” movie franchise. If anybody out there knows anything about this, and Andrea Coyle of GANYC or Sergey Kadinsky – I think Im talking to one of you, please share. 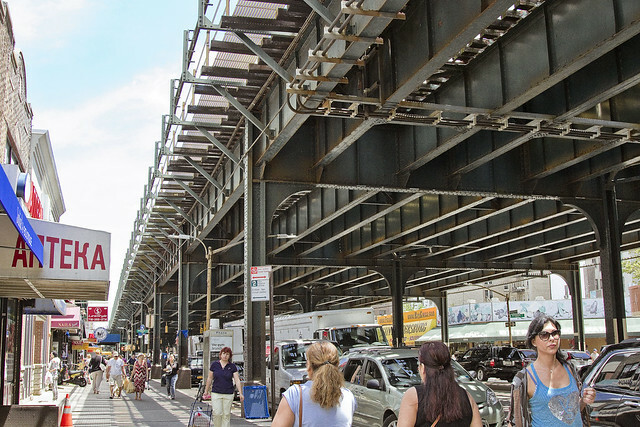 One was now on a mission in South East Brooklyn, which carried me in a generally eastern direction, and I soon found myself turning onto Brighton Beach Avenue and under the elevated tracks of the Brighton Line. Famously, this area has become overwhelmingly Russian in the last few decades, and the storefront signs were all in Cyrillic. Brighton Beach wasn’t my destination, of course, and I was just passing through the community on my way to another one of my old haunts. More on that in a future post, at this – your Newtown Pentacle. 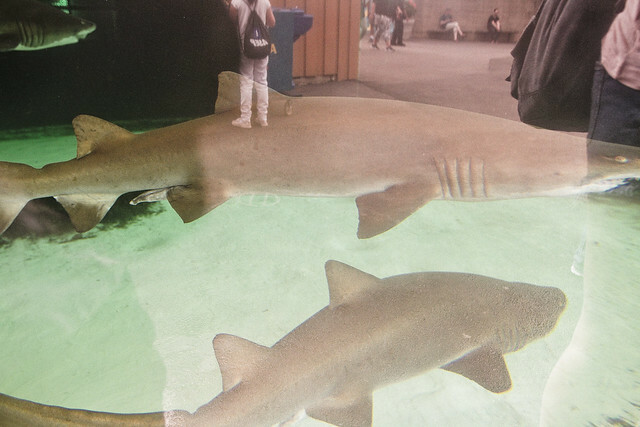 Coney Island Aquarium, in today’s post. 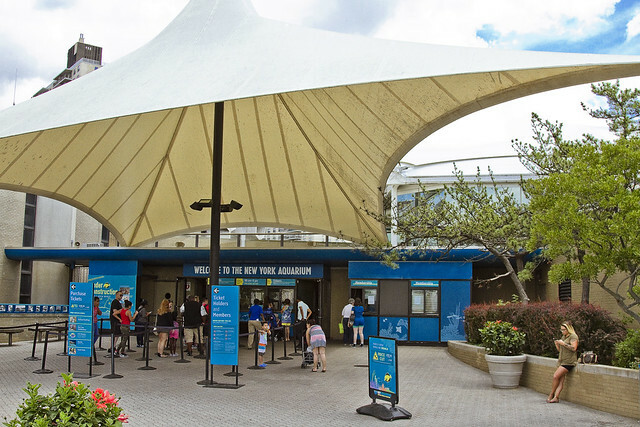 The NY Aquarium is based in Coney Island, Brooklyn. It is the very definition of the “House of Moses” as it was NYC’s master builder Robert Moses who actually created the modern institution. Moses had ousted the Aquarium from its former home on the Battery in Manhattan, at Castle Clinton, when he was pushing to build his Brooklyn Battery Bridge (one of his few defeats, but he got to take over the tunnel project instead) back in 1941. 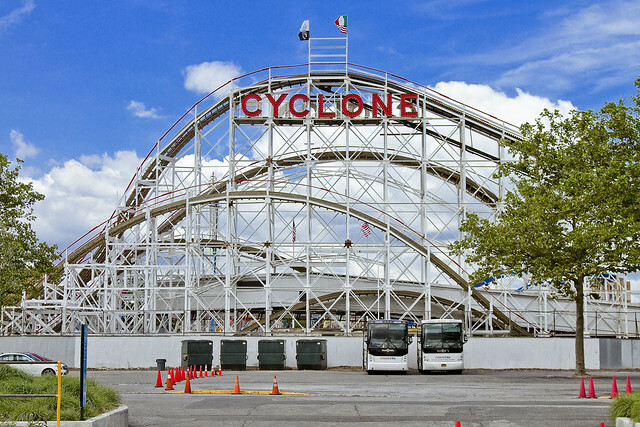 In early June of 1957, Moses unveiled the NY Aquarium here in South Eastern Brooklyn, right next door to the landmarked “Cyclone” roller coaster which predated it by around thirty years and which is pictured above. As an aside, the Aquarium is the former location of the semi legendary “Dreamland” Amusement park. 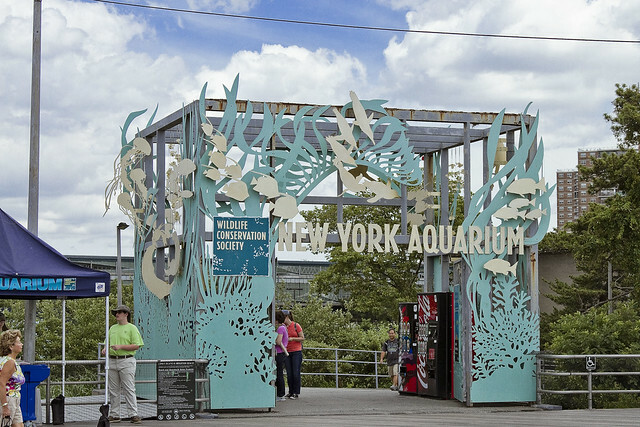 Currently operated by the Wildlife Conservation Society, which manages all of NYC’s premiere animal prisons, the Aquarium was hit hard by Hurricane Sandy and is frankly a shadow of its former self. The good news is that there’s a significant amount of construction going on at the site, which should restore the place to its former glory, but there’s not all that much to see hereabouts at the moment. Regardless, due to my NYCID card granted free membership to all the WCS managed properties, I had free admission, so in I went. 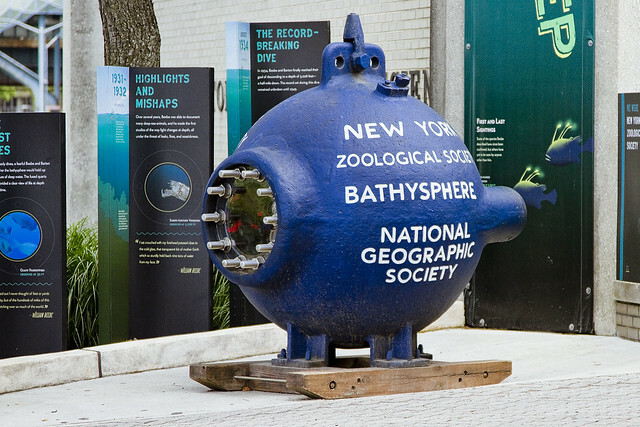 The bathysphere located outside the Aquarium has to have had every Brooklyn school kid of the last sixty years climb on it. It’s an artifact of the 1930’s, this pressure capsule, and was used by a zoologist name Beebe and an engineer named Barton (who designed, built, and maintained the thing) to “deep dive” and observe critters in the depths of the sea. It set records for depth back in 1934, as a point of interest, and the bathysphere is said to have descended some 3,028 feet down into the water. Just after entering, you encounter a dark chamber filled with tanks of various sorts of itchyan critters. It’s pretty darkly lit in there, and as the room is packed with little kids losing their minds at the sights, you need to be pretty careful where you step to avoid squishing any of the kids as they bounce off the walls. 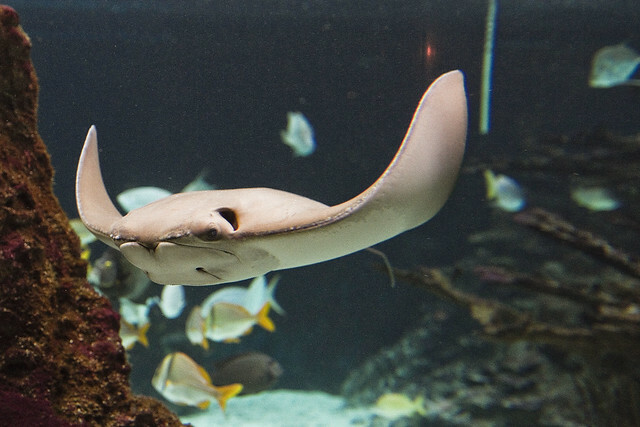 I’m no ichthyologist, but I’m pretty sure that’s a ray. This critter was in the largest of the tanks. One is curious about the “behind the scenes” stuff maintaining these tanks – the filters, aeration, and circulation systems alone must represent a volume of water 2/3 larger than what you see in the tank. There were pretty big populations of fish swimming around in these displays, so there has to be some pretty interesting plumbing connected to it, IMHO. It’s a pretty challenging environment to shoot inside the Aquarium, incidentally, as the tank walls seem to be composed of some sort of thick plastic which created a lot of visual artifacts and light refraction. 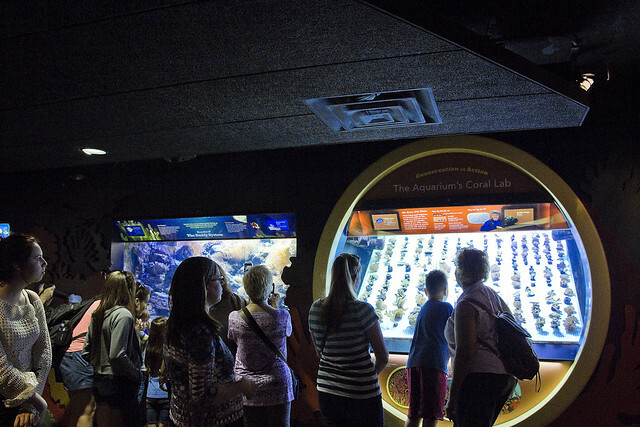 It’s also, as mentioned, fairly dark in there, and the light levels are set for the comfort of the inhabitants of the tanks rather than for their observers. My “bright lens” which is capable of large apertures such as f1.8 was deployed, and I used one hand as both a light baffle and pad for the lens as I brought it nearly up to the tank. The light baffle part was to control reflection from light sources behind the camera, the “pad” was to avoid directly touching the glass. I had autofocus on, and was “spraying and praying” the shots. Worked out fairly well, with a roughly 40% success rate, as far as image fidelity goes. That’s some sort of weird tentacle monster above, might be related to certain star spawned deities who are both the key and the gate, and in whom all are one. Y’know, the thousand faced goat from the woods. 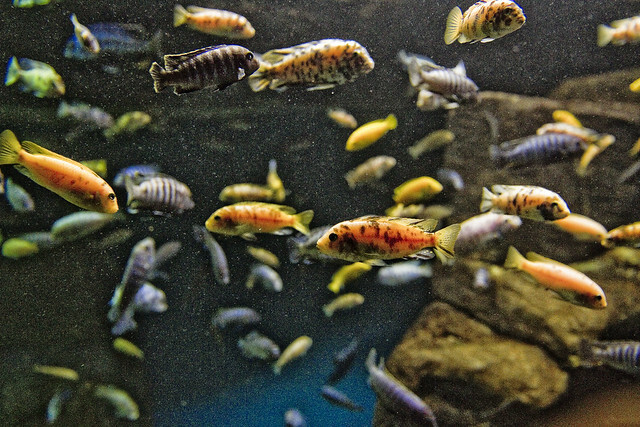 In another of the tanks there were what looked like schools of Cichlids, in sort of simulated lake environment. 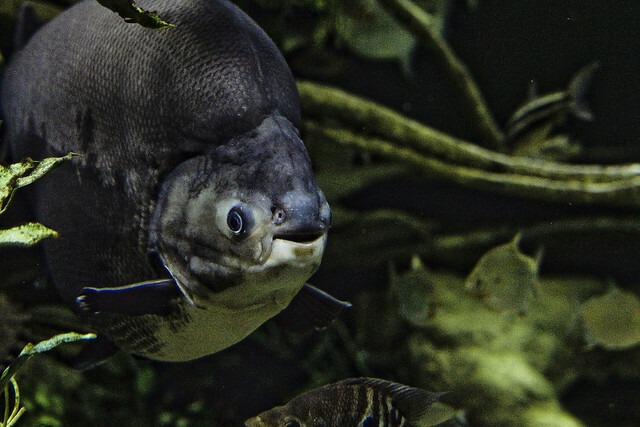 That’s what they looked like to me at least, but as mentioned, I’m no ichthyologist. Some truly enormous river fish were observed in another tank. I’ve seen smaller specimens of this critter on sale at tropical fish stores in the past, and they’re all jaw. 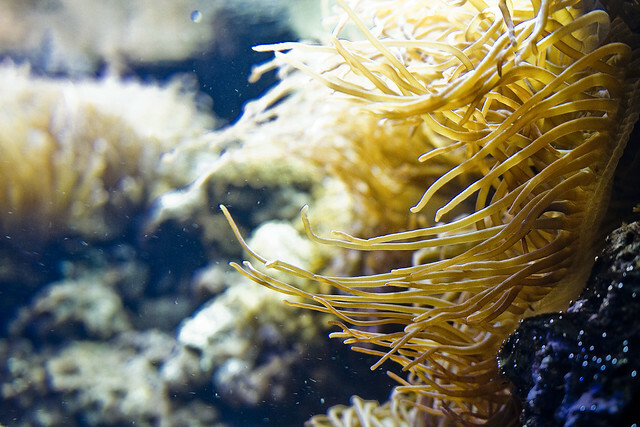 One of my college jobs, incidentally, was working as an Aquarium Service technician. I’d show up in rich guy’s manhattan offices who had contracted with my boss, and I’d do all the fish tank maintenance chores for them (deep filtering, water change, chemical tests for ph and ammonia levels, assess fish health, mechanics of tank, etc.) I did a couple of Chinese restaurants in midtown as well, which were huge all day jobs on 500 gallon custom salt water tanks. Back in college, I was also a fine art mover, a clerk at a fotomat, a dishwasher – pretty much anything I could do for money I did. Once I took a job shoveling poop. Told you that visiting this part of Brooklyn made me nostalgic. 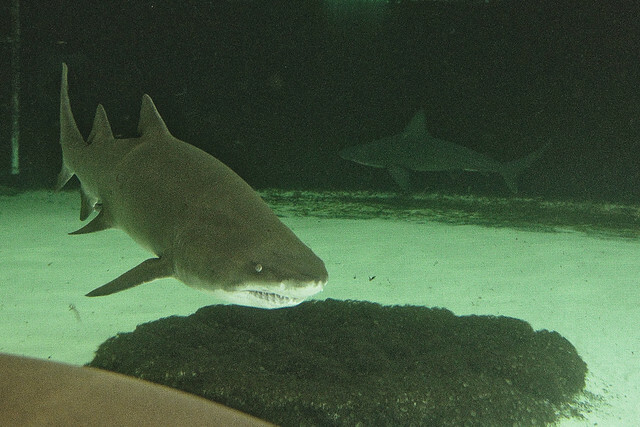 A temporary tank is housing the Aquarium’s collection of various shark specie. Were Sharks capable of any thought beyond “kill” or “hunt” I might feel sorry for them, but they’re not, so I don’t. 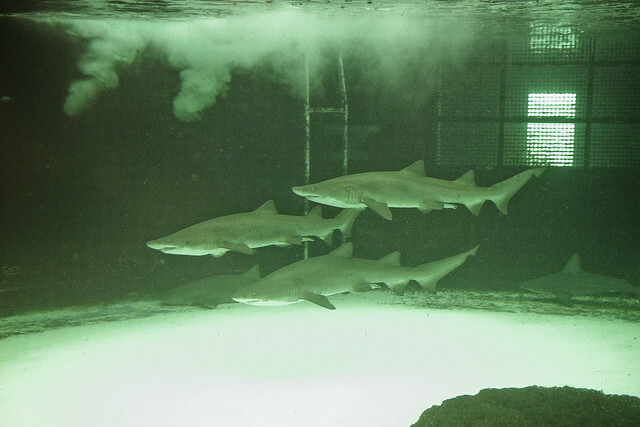 Apparently a new Shark enclosure is under construction which should make them as happy as Sharks are capable of being when they’re not killing. Affordable housing for Sharks, this? Personally speaking, a welcome will be offered to our new overlords, as the only mount I have to ride into battle on would be an increasingly lazy dog named Zuzu. Remember my little explanation of how to guard against backlit reflections in photo situations like these? This is what happens when you don’t do that, but I thought it made for a neat effect. Almost looks like a double exposure, but it’s just the reflection on the curved glass as the killers slipped by. Having accomplished a minor goal, one’s spirits were high and an exit through the Aquarium’s Coney Island Boardwalk portal was engaged. All told, I was at the facility for about an hour. It was fun, and a I look forward to returning when the WCS has built the new enclosures and fully recovered from Sandy. Trying to decide what to do with myself, as I’d just spent equal amounts of time at the Aquarium and on the train ride to Coney Island from Astoria, a definite course of action was decided upon. Before you ask, those box thingies on the stilts in the shot above house the Beach’s “comfort stations” and provide the Parks Dept. folks with offices. They run taxpayers about $2 million each, and these are two of the 35 of them being installed on city beaches. They’re built by the Deluxe Building Systems Corp., have galvanized steel frames to withstand the salty atmosphere and weather events, and are brand spanking new. I turned eastwards, as a silly idea suddenly occurred to me, and the desire for luncheon began to rumble. A travlin’ man, that’s me. 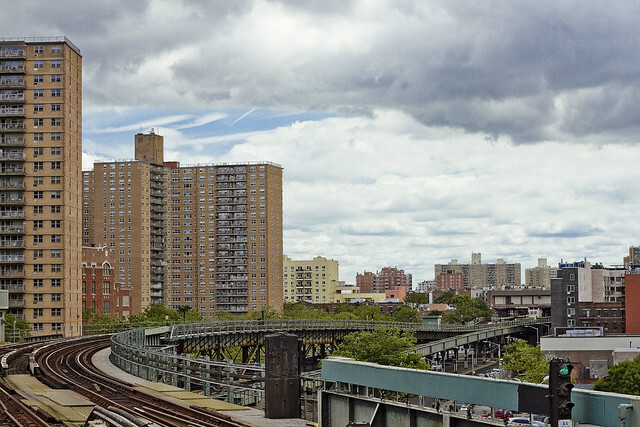 Pictured above is Astoria, Queens’s 31st street and the elevated subway tracks which both distinguish and curse the spot once known to a newly consolidated City of Greater New York as Second Avenue, and to the Village of Astoria section of an independent municipality called Long Island City as Debevoise Street. 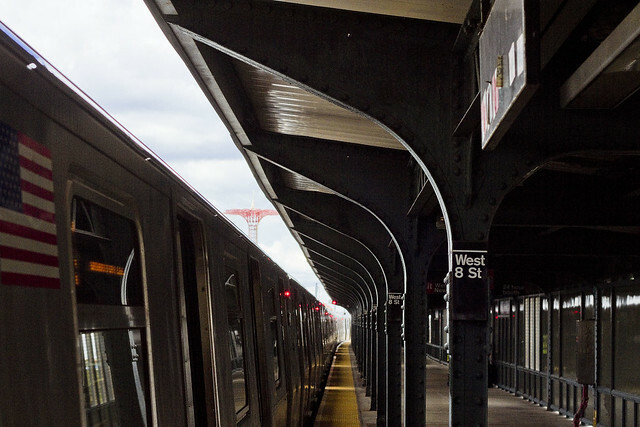 These particular tracks, which are known to the MTA as the IRT Astoria Line, opened for business back in February of 1917, and today carry the N and Q lines between Ditmars Blvd. and the Queensboro Bridge. 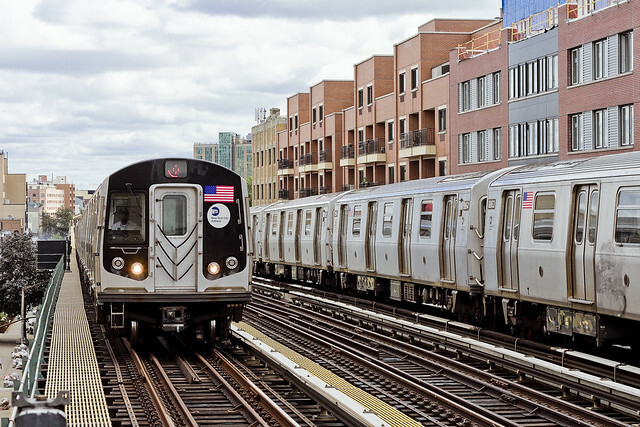 Saying that, the predecessor of what we know as the Q Line (which is part of MTA’s “B” Division’s BMT service) began coming to Astoria at the end of April of back in 1950, after the purpose built IRT platforms were modified to accept the BMT trains. It’s actually called the Brighton Line, the Q, and that should tell you everything about where I was going last Monday morning. According to the MTA website, it was only going to take me 45 minutes to cross the western tip of a Long Island, from North to South by South East. This calculation proved somewhat true, and the journey took me around 50-55 minutes. On the way, I listened to an audiobook of H.P. Lovecraft’s “Call of Cthulhu” just to get into the mood. One had finally found the time, you see. On the other side of my journey from Astoria, the first thing I noticed were the elevated tracks which lead to the Coney Island Stillwell Terminal. Normal people call that the F, but not me. 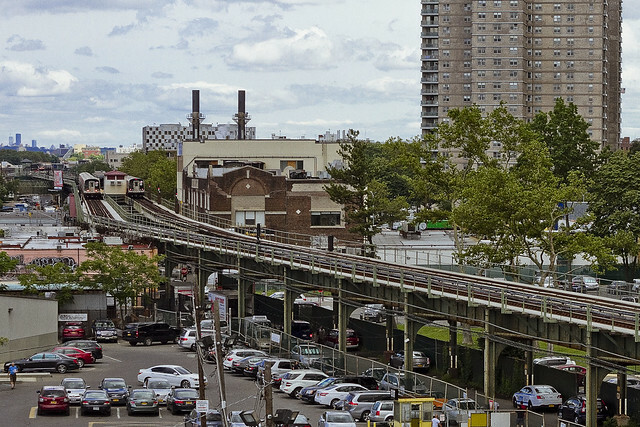 What I see are the tracks of the IND Culver line, and a rapid transit connection that runs between southeast Brooklyn and Jamaica, Queens. 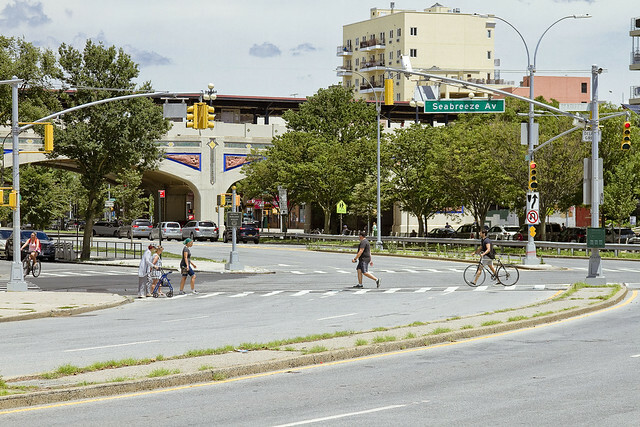 So… lessee… that means that even without the proposed BQX streetcar system, you can connect from two wildly separate sections of Queens to the same locus point in Brooklyn. It also suggests that since you can go further and faster using this already extant path… bah, what does logic have to do with De Blasio’s New York? And that’s before the Russian mobsters arrived. My little journey was spurred on by the NYCID card which was obtained back during the winter, and more than once at this – your Newtown Pentacle – you’ve read of my desire to visit all of NYC’s premiere animal prisons. In particular, the one that’s found here in Southeast Brooklyn which I haven’t visited since grade school. This area, less than an hour from home in Astoria (where I’ve lived for around a third of my life), is close to the part of Brooklyn which I spent the first third of my life in and is the outer edge of my old stomping grounds. 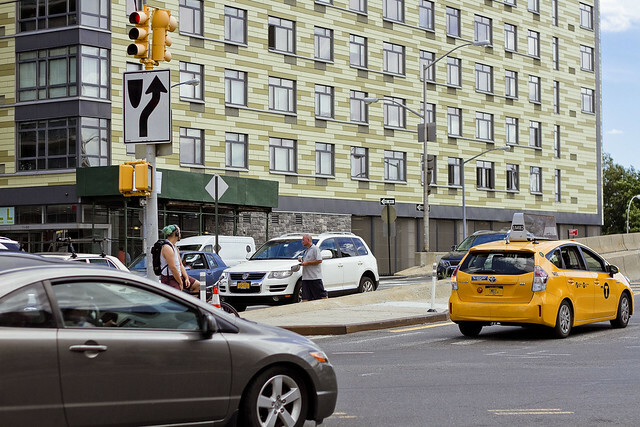 Specifically speaking, my family lived about 2-3 miles east of here at the Canarsie/Flatlands border, but in the broader sense – I felt like was returning to my home town. The Lenape tribe which lived here called this barrier island “Narrioch,” which means “land without shadows.” Given that I spend most of my time in North Brooklyn and Western Queens along a waterway which the Lenape referred to as “Hohosboco” or “the bad water place” and which modernity refers to as the Newtown Creek – seeing Jamaica Bay rising on the horizon beyond Coney Island… it got me all nostalgic. That’s when I dropped the Lovecraft audiobook and started listening to Iron Maiden. There’s a lot of things I don’t want to think about. 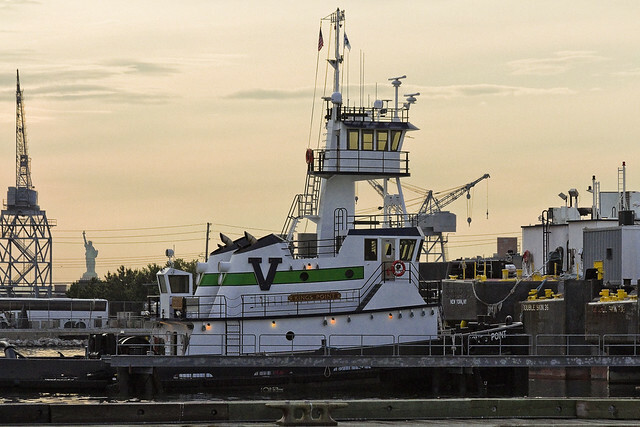 For the last decade or so, one has been overly concerned with all things maritime. An area of particular study has been NY Harbor, and one of the subjects which I’ve been curious about is the bottom of it. Anything hidden seems to draw my attention, after all. There are rumors, and carefully occluded “pregnant” statements, which have reached me in recent years – some of which are specific, others quite vague – and appropriately so. The one that the security apparatus of our fair City is heavily invested in submersible drones is one rumor. I’ve also been told that there are esoteric state of the art sensors hidden around the harbor – slung from the bottom of bridges and other water facing perches – that scan for radioactive and chemical signatures emanating from passing maritime traffic. This is – of course – another rumor. A friend and former colleague recently commented to me that she was on the Staten Island Ferry and was surprised at the presence of a heavily armed Coast Guard vessel that was following it. 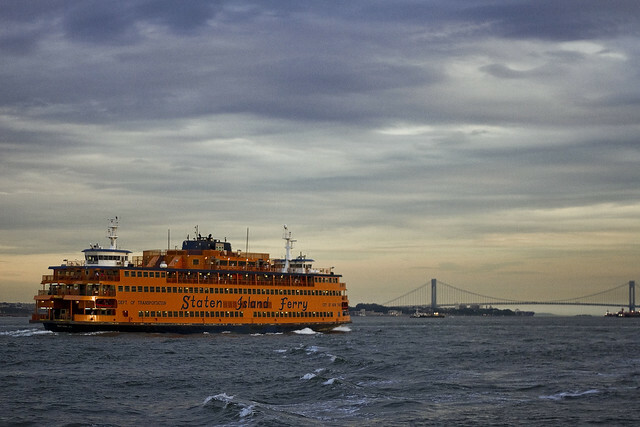 I informed her – and this is no rumor – that the Staten Island Ferry looms large as a potential terrorist target and that both the Coast Guard and NYPD Harbor Patrol have stepped up security coverage for the service since 2001. At any given time on the Ferry, there are several uniformed Police onboard, armed with standard firearms. The cops you see are supposedly just the public face, and rumor has it that there are heavily armed combat ready gendarmes onboard as well. The rumor involving the Ferry is not about the security personnel whom you see, but rather the security equipment, drones, and personnel that you don’t see. 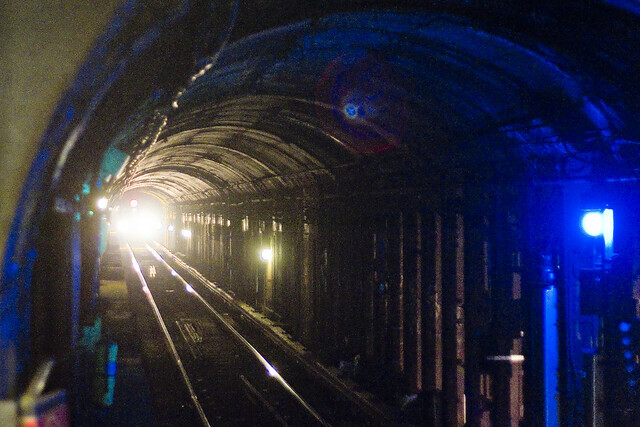 The subject I’m super curious about involves the Subways, of course, and the sort of gizmos and weaponry deployed down in the sweating concrete bunkers underlying the City. I can usually spot an undercover cop at around 20 paces, due to certain “tells.” There’s a certain gait which the Police develop, certainly due to wearing that heavy equipment belt and being on your feet a lot, as well as a particular demeanor. I see them all the time on the train, but again, I know what to look for. Officers, nobody wears knit polo shirts anymore. Also, if you’re dressed up to appear homeless, don’t be clean shaven. Seriously, how much can one guy take? Often, and in excruciating detail, have I been told how annoying my company actually is. Noticing every little detail as I move around is one reason I’m so aberrant a fellow, forcing people to listen to me rattling on about my trivial observations is another. More often than not, it’s a habit of relaying unpleasant facts about activities which my companions and myself are engaging in which pisses folks off. Talking about my mother’s cousin Melvin, whose grisly death occurred after he fell off a moving boat and was sliced up by the propellor back during the 1960’s, or the actual process of drowning, described while riding onboard a boat are two. Talking about human decay processes while in cemeteries is yet another. 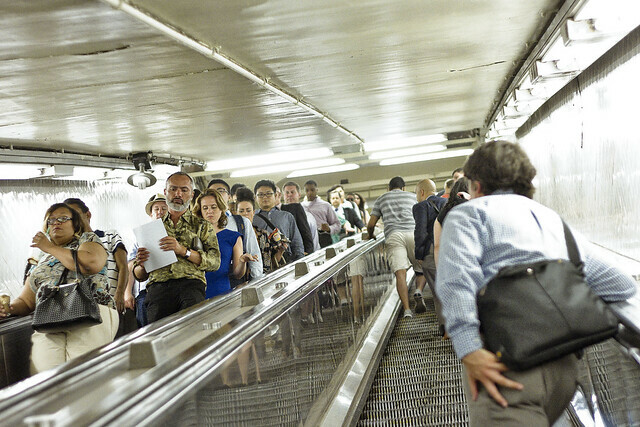 You never want to hear me say anything about escalators, btw. Deadly things – my buddy Hank the elevator guy shudders whenever the subject comes up, and he’s a guy who regularly dangles from ropes in elevator shafts. Long story short – hamburger meat. Escalators are meat grinders. Brrrr. Don’t ask. 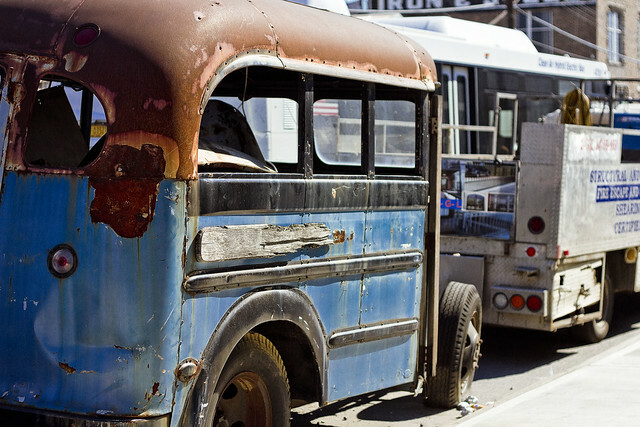 A scene from de Blasio’s New York, specifically the foot of the Pulaski Bridge on Jackson Avenue in LIC. The guy with his hat out has turned up in recent days, and made this the spot at which he goes to every car that’s leaving Brooklyn asking for spare change. It is only a matter of time before we click fully back into the Dinkins era and this dude finds himself a squeegee. Jesus, what the hell is wrong with you people? Give a hoot, don’t pollute. Find a god damned trash bin, they’re all over the place, even if they’re filled with household trash from illegal sublets. This one actually blew my mind when it was explained to me. It’s the window of a fancy shmancey supermarket over in the newly built up waterfront section of Hunters Point – tower town, as I call it. 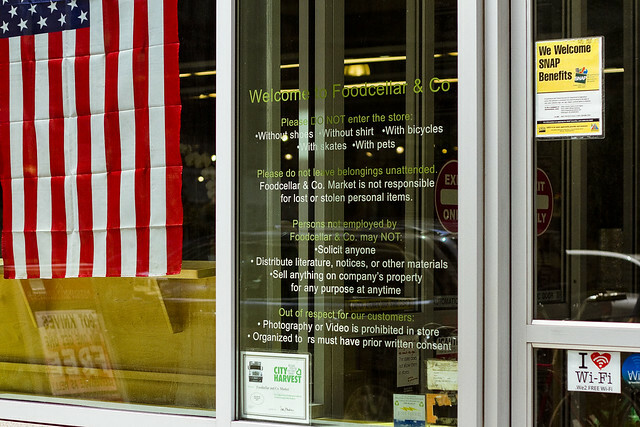 The “out of respect for our customers” prohibitions against “photography” and “organized tours” got me curious. My thoughts of “are Jack Eichenbaum or Kevin Walsh doing LIC supermarket tours now? Wow, wonder if I can get in on that?” were immediately quashed by a long time friend who lives nearby. 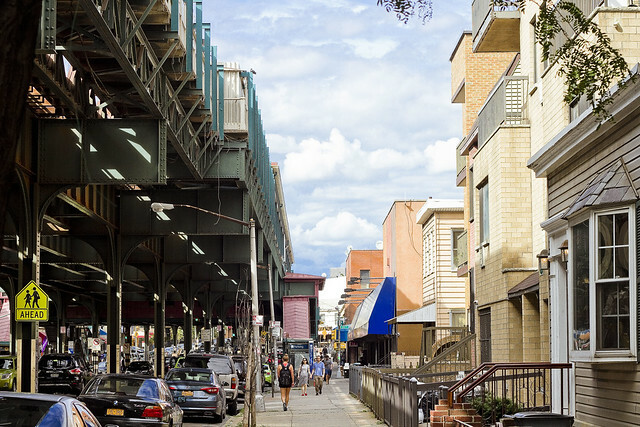 She explained that realtors will often bring groups of prospective condo buyers into the local supermarkets and shops to demonstrate that there are – in fact – places to shop in Long Island City. So many buyers have moved through their doors that the shops and supermarkets have had to set rules. 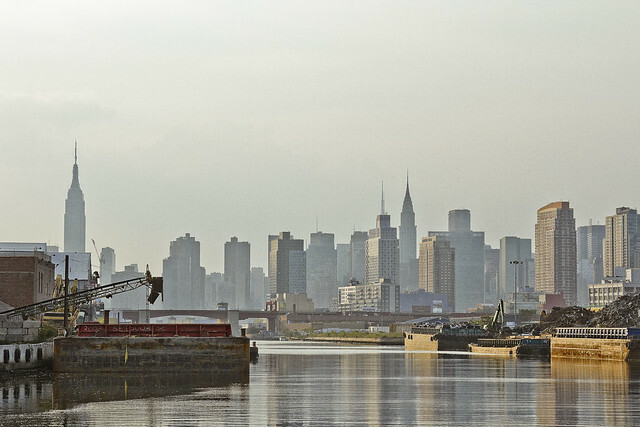 A bit of Newtown Creek “now and then,” in today’s post. One has been at work on several subjects regarding that fabulously decadent cataract of Municpal neglect known to all as the Newtown Creek. It’s kind of big picture stuff, which requires a “long tail” of research on and about certain industries. You can’t understand something modern unless you understand its past, I always say. 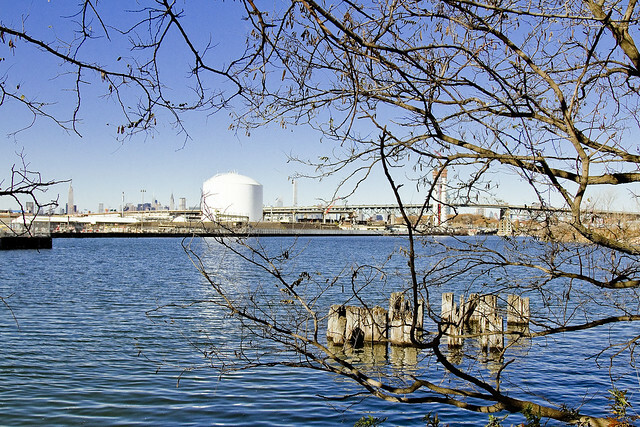 For example – If I want to describe the Brooklyn Union Gas Manufactured Gas plant on Newtown Creek in Greenpoint (which is now the National Grid LNG plant on Varick), I need to possess an at least topical amount of knowledge regarding the history and technology of the 19th century Manufactured Gas Industry in New York City. Actually, that’s not an example, it’s precisely the thing I’ve been working on – to develop an understanding of. Manufactured Gas Plants – or MGP’s as they’re known in the environmental community. This sort of research always turns up a few surprises, and for an area like Newtown Creek – which is of truly national importance in the story of the second industrial revolution, but for which scant historical visual documentation exists – it’s sometimes pretty interesting. Harper’s Weekly was on quite a tear about my beloved Creek back in the summer of 1881, and presented a few illustrations of “the horror” interspersed with texts describing the oil drenched mud and stinking waters of Newtown Creek. Here’s my speculation as to what I think we are seeing in these drawings. Educated guesses, btw., that’s all. Nowadays, the outline of Newtown Creek barely resembles what it looked like back in 1881 – there used to be a couple of islands in the Maspeth Creek/Turning Basin area for instance – but there are few historical constancies with which you can reckon location around the creek when old photos or even illustrations are presented. 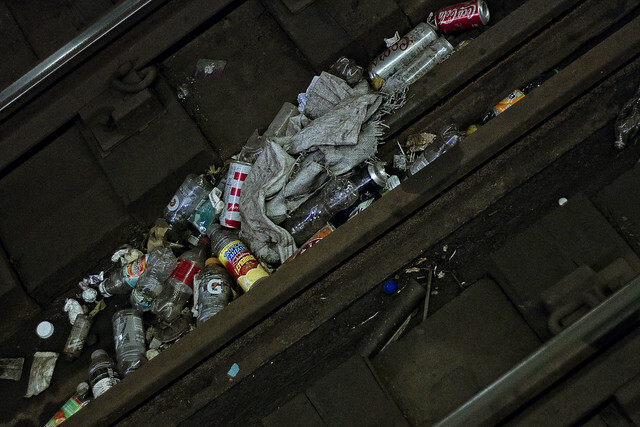 The LIRR tracks are one of them, and another is the Maspeth Avenue Plank Road. In the shot above, that pile of piles on the shoreline in the center of the shot? The smokestacks on the far shore? The gas holder tanks on the horizon? I think that the illustrator was sitting right about where I was last winter, at the shoreline intersection of industrial Maspeth’s 58th road with Newtown Creek, looking south west towards Greenpoint’s National Grid LNG site with the ruins of the Maspeth Avenue Plank Road directly in front of me. 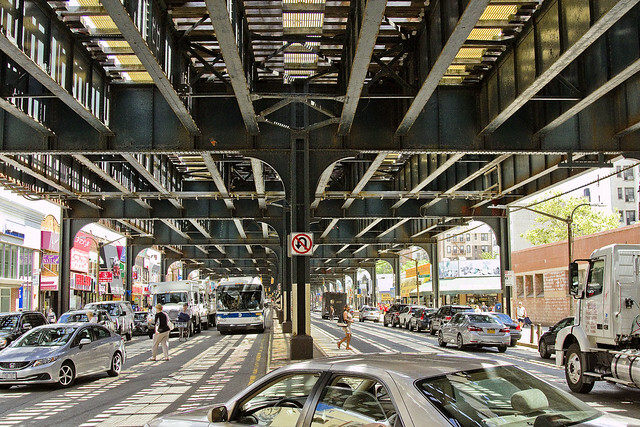 The view above has railroad tracks in it, ones which follow a certain curve, one that has remained fundamentally the same since the LIRR laid them down in the late 1860’s. The tall smokestacks at the left of the shot are likely those of Phelps Dodge. The ones off in the distance are probably the Haberman rendering plant. Calvary cemetery would be to your left, and I have a sneaking suspicion that the illustrator set up his tripod at Penny Bridge – which is the modern day spot that Review Avenue transmogrifies into Laurel Hill Blvd. That would put the illustrators point of view somewhere on the eastern side of Blissville, looking eastward towards Maspeth. I’m of the belief that this is the same shoreline seen in the left side of the shot above, although my photo was captured from out in the middle of the channel while onboard a boat. The masonry on the lower right – or Brooklyn side – of the shot is what’s left of old Penny Bridge, and the 1939 model Penny Bridge (Kosciuszcko) is right where that divot on the shoreline is in the 1881 illustration from Harper’s Weekly. Phelps Dodge would have been found on the east side of the Kosciuszcko Bridge, and their property included the gray building with the blue stripe (the modern day Restaurant Depot). Cool cars, Bushwick East Williamsburg edition. 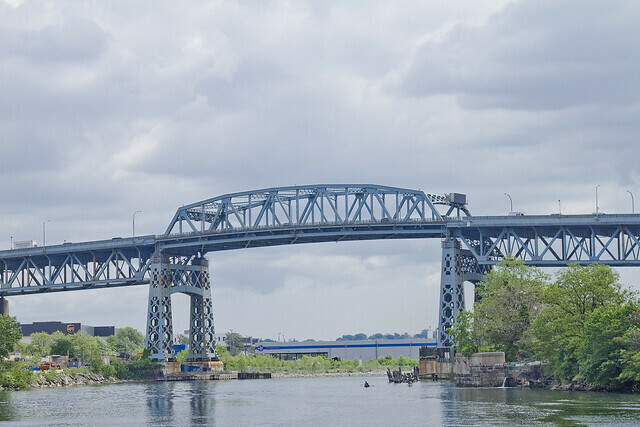 One was happily scuttling along recently, on his way to conduct a tour of the “Insalubrious Valley of the Newtown Creek,” when a charming old rust bucket was encountered on Grand Street not too far from the centuried swing bridge named for it. Unlike other “cool cars,” described at this – your Newtown Pentacle – I’m unable to describe make, model, year, or engine type as frankly – there wasn’t enough left of the thing to do so. 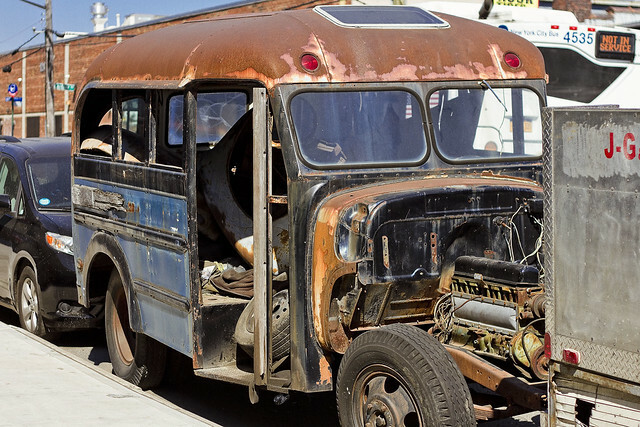 I can tell you that it was a short bus, and that it still had an engine. 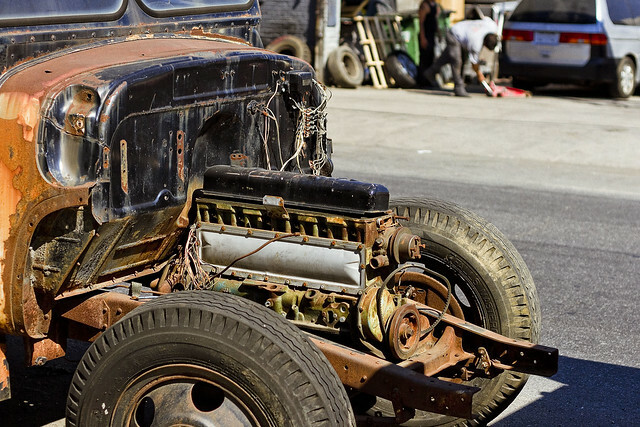 It was missing a radiator and all the other parts which would attach around the engine, including the front end’s entire outer body. There were four tires on the thing, so that’s something. Additionally, inside the relatively intact passenger cabin, there seemed to be quite a few bits and bobs being stored. Looks like a handyman special to me. 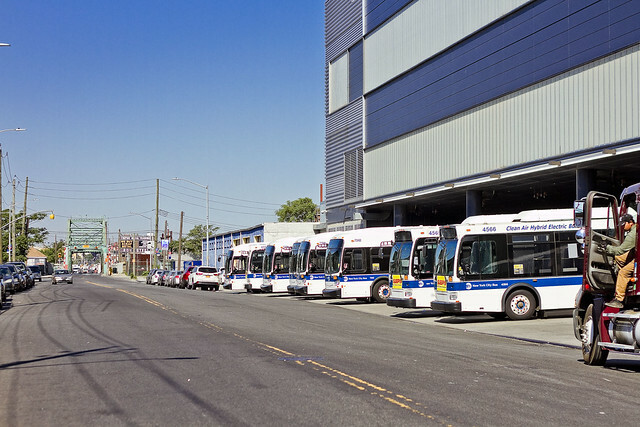 Just on the other side of the Newtown Creek in Maspeth – where Grand Street transmogrifies into Grand Avenue upon leaving Brooklyn and entering Queens – the short bus’s owner could probably find all the help he or she needs with the project at the MTA’s Grand Avenue depot. A 600,000 square foot facility that’s four stories tall, the Grand Avenue depot can store 200 city buses at one time just on the first floor. It’s the second floor that would come in handy for the short bus’s owner, as one of the 27 maintenance bays up there would be just the thing to getting this “cool car” up and running again.